After a long stretch of weekends being filled to the core with fun, we finally had some downtime over last weekend to get some much-needed work done around the house. Although we don't usually spend an extended amount of time in our guest room (it's quickly turning into craft and wedding-storage central), that very large, very blank wall on the west side of the room has been eating at me since we moved in. We added the green map bench, but that only seemed to magnify how bare that wall really was. I've been wracking my brain trying to come up with something clever to cover the wall, but it seems my creativity mode is in serious standstill. So, what do you do to fill a space when you don't have a handful of super-awesome vintage suitcases to saw in half and attach to a wall? This simple LACK IKEA shelf has been with us since we moved in to our old apartment together in 2009. There, it also took up space on a wall in our guest room. When we bought our house, it served as a makeshift TV-box and Wii console shelf under our TV. When we got a new Google-enabled TV (thus, not needing a DVD-player to access Netflix online), the shelf had nothing to hold... so it traveled down to the basement. Finally, on Sunday, it made its triumphant return upstairs in a place it would feel most comfortable: the guest room. 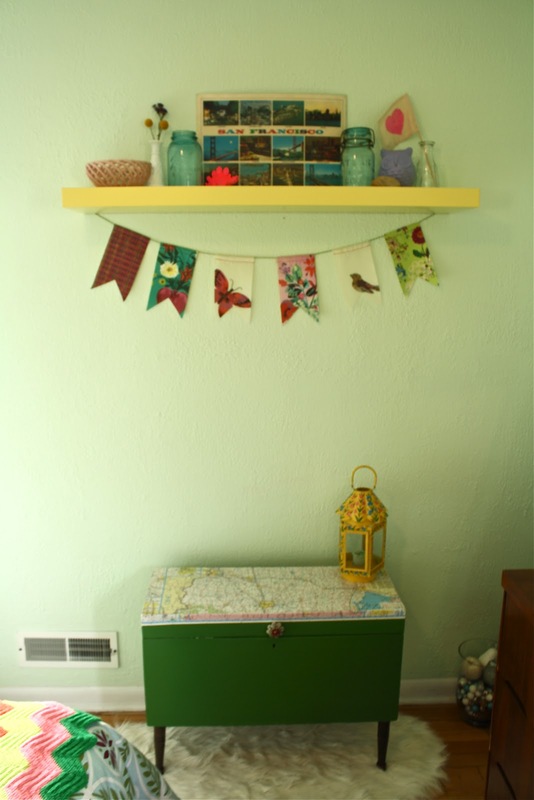 The whole room is filled with bright color, so we thought the happy little shelf would make a great addition, especially above the map bench. To fill the empty shelf, I grabbed a few things from around the house. A mix of old jars (which I took from our to-be-used-at-the-wedding collection), a pink ceramic "woven" bowl I picked up from the clearance shelf at Target last week, one of our purple owls, a vintage San Francisco laminated place mat we bought from a thrift store over a year ago but didn't know where to place it, a rock we brought home from the lakeshore on a trip to Door County, a hot pink dinosaur (because I personally believe there should be a neon-colored dinosaur in every proper home) and a little heart flag that you'll learn more about in an upcoming post. I also hung some bunting I purchased on clearance from BHLDN a few months back. Guests should rest in comfort with Mr. Pinky keeping guard over them from up high. RAWR! I'm so happy with how much visual interest this shelf and its goodies add to the room. I'm also super pleased I was able to find knick-knacks from around the house that fit the color scheme of the room - bonus points for filling the space with objects we already had around the house. Nothing like a free room makeover! SO much better! And now, I can breathe. The void had been filled!! !